244 pages | 5 B/W Illus. 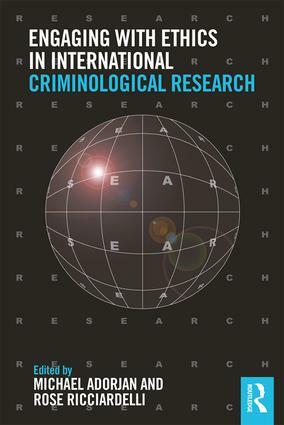 "Engaging with Ethics in International Criminological Research brings the ethical issues and challenges confronted by the criminological researcher to life. Rather than provide dry guidance on how to navigate institutional ethics review, it contains a wealth of insights – from international scholars at the forefront to contemporary criminology – into the ethical thinking and decision-making involved in all serious criminology. These contributions are full of interesting and thought-provoking discussion of profound moral issues. It will be of interest to anyone researching, studying, or teaching criminology." "Drawing on scholars studying myriad international sites, Engaging with Ethics goes beyond other books that merely criticize the power structure providing a blockade for research, instead offering programmatic statements and examples of how to navigate through these barriers to produce empirically rich, theoretically driven, yet ethical research that honors both those we study and those who write about criminals and criminal justice settings." "Universities have defined ‘ethics up’. In doing so they have fundamentally reshaped, and are actively reshaping, how research is done. Nowhere is this more evident than in Criminology. Engaging with Ethics offers insightful reflections on this ‘ethical creep’ – its history and its implication across geographically dispersed research areas. It calls for an ‘ethical imagination’ grounded in the ‘lived experiences’ of active, experienced and sensitive researchers." "Adorjan and Ricciardelli and the contributors have assembled a valuable set of materials on a critical, yet understudied topic. They take the reader inside the dynamics of field research to explore areas not covered in traditional methods texts. A must-read for both experienced and novice field researchers." Michael Adorjan is Assistant Professor of Sociology at the University of Calgary, Canada, and Fellow with the Centre for Criminology, University of Hong Kong, China. Rose Ricciardelli is Associate Professor at Memorial University of Newfoundland, Canada.